I came across this recipe a few months or so ago, and it has become one of my favorites. It's one of those dishes that tastes great the first night, and seems to be just as good, if not better, the next night as left overs. I made it for some of my friends a few weeks back and they totally loved it. I think what I love most is the sauce which is like a tangy sweet sauce which consists of soy sauce, a little garlic and lots of honey. 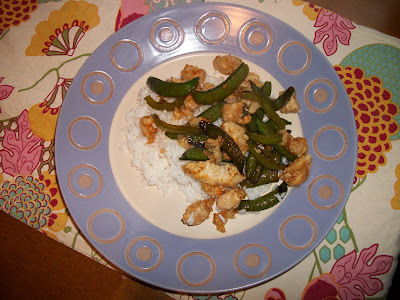 The slight crunch from the chicken, snap peas and peppers makes it feel kind of hearty, but yet kind of healthy. Prepare and slice all veggies – feel free to add whatever you would like. In 2 separate bowls, add the egg whites (lightly beaten) and the cornstarch or flour. (The cornstarch will yield a “crispier” chicken). Heat a large skillet over medium-high heat and add 1 tablespoon olive oil. Add veggies with a sprinkle of salt and pepper and saute for about 5 minutes, until softened. Add in soy sauce and garlic and stir so veggies are coated, about 60 seconds. Remove from skillet and set aside in a bowl.